This unedited compendium of texts, as a ‘mirror of princes’, offers instruction to Juan II of Castile (1405-1454) on how the king should govern. Made in or shortly after the 19th year of his reign, this is an unknown testimony of royal duties with a personal touch. 185 x 140 mm. – 63 leaves (incompl.). With 7 full-page miniatures, royal coat of arms, 1 large historiated initial, 1 historiated border, large ornamental initials. The manuscript contains a combination of educational texts addressed to the young king of Castile and Leon, Juan II (1405-1454). As the anonymous author addresses the king directly and speaks of injustice inflicted upon him, these texts offer a challenge for historians to unravel the author's identity. The lively and colourful illuminated miniatures present the king in his role as supreme law-giver, governor, military leader, and example of chivalric conduct. They show how royal identity is defined and may also provide a portrayal of the monarch for the next generations. A detailed mappa mundi informs the ruler about Spain's neighbours and its place in the world. The fascinating, intriguing circular disc, that shows the world as it was known at that time, presents the three continents of the habitable world with 'east' at the top. The circular map of half land and half water, inviting seafaring, predates Columbus' explorations by more than half a century. The compilation of texts can be summed up as a ‘Mirror of Princes’ or Fürstenspiegel, a concise manual of educational texts. The manuscript opens with definitions of royal virtues and records the chivalric deeds of Antiquity’s princes, such as Alexander the Great. It discusses the most useful members of a society (farmers come first), the value of money, the use of astrology and the abuse of sorcerers. The moralisations on the virtues and duties of a prince are followed by a survey of the celestial spheres as well as the known world. It offers descriptions of countries and their inhabitants, and of Spain and its kingdoms with Toledo as capital. In what follows next, the text is mutilated on purpose while several lines have been erased and other added. The book concludes with a tract on the movements of the sun and the moon, eclipses, the length of cycles, months, days and minutes, leap years and time variation. It can be dated by the computational tables referring to the first 19 years of the reign of Juan II, beginning in 1405. This implies that the manuscript was made in or shortly after 1425. As Juan’s heir, Enrique IV, was born that year, the manuscript may well have been destined for his education too - and later, may even have been seen by his half-sister, the future queen Isabella. Its small format indicates the codex was made for private use. The anonymous writer shows himself to be a learned person, perhaps a member of the clergy. He cites many learned sources, not only books by Aristotle, but other classical as well as medieval authors, including Arabic texts, the Book Raziel (a Kabbalah grimoire) and several juridical works. At various instances the author addresses his king directly and by the use of the king’s images and symbols of royal power, he also expresses his loyalty and allegiance to the monarch. His identity remains unknown, but he must have been from the close circle of the royal court. In the text, he pleads with humility for himself and he indicates he has been unjustly accused, held in captivity, some of his goods forfeited and was living in France. The author humbly implores the king that he examines the said injustices and that he set things right according to the power invested in his office. Technical research might possibly recover some of the erased passages and reveal what should have stayed hidden. Further research could also offer a better profile of the author: a man who was intimately connected to the politics of his day and the humanist culture at the court of Juan II. Many secrets of this intriguing codex are still to be revealed. 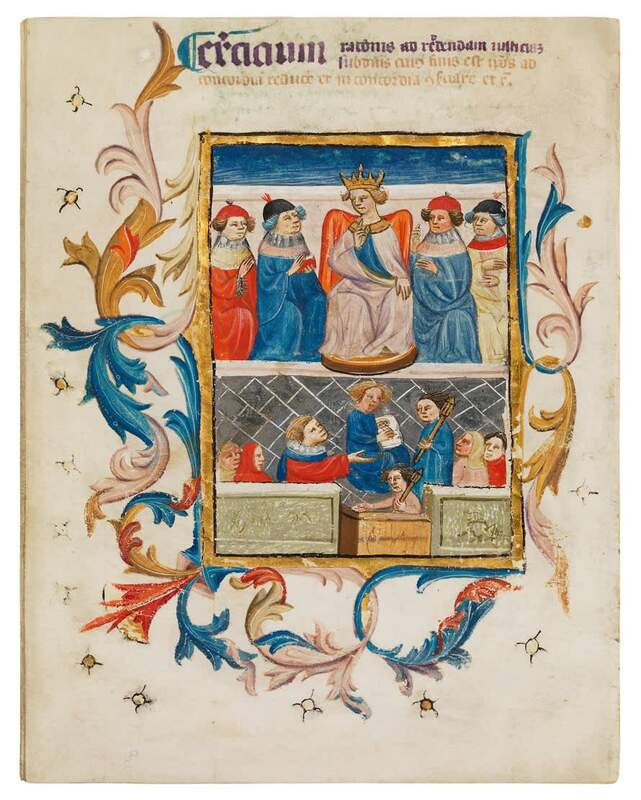 The manuscript at hand seems to fit in the genre of texts actively promoting the ideal government of a king, as an educational instrument for the young king with miniatures to define royal identity. The eminence of the monarchy of Castile is emphasized at a time well before the Reconquista was accomplished and before the thrones of Castile and Aragon were united. The text explicitly describes how Spain est apta naturaliter ut gubernetur per unum principem. Indeed, one generation later, this unification was established under los Reyes Católicos, Isabella I of Castile (daughter and heir of Juan II) and Ferdinand II of Aragon (1492) who finally achieved internal peace and stability in Spain. This marked a turning point in world history, to which this extraordinary manuscript may have contributed. For further information please refer to our Spotlight Impetus for Exploration.